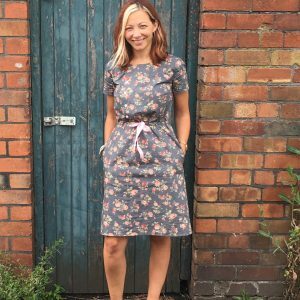 I recently tested a lovely day dress pattern for New Zealand designer Jennifer Lauren Handmade, called the Mayberry Dress. If you haven’t seen her patterns yet, head on over to her website immediately! 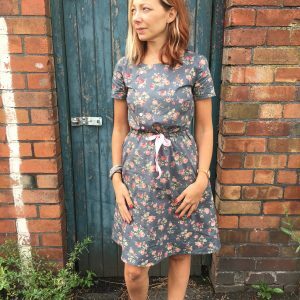 The Mayberry is quite a casual dress with side seam pockets, a button up bodice and a waist tie. 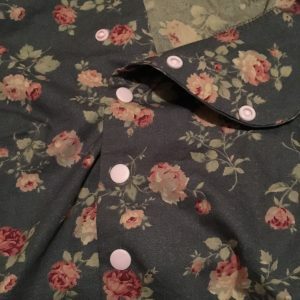 I made my test dress from a lovely navy and floral cotton fabric that I got from Fabricland. I chose pink snaps, rather than buttons for the bodice and then a pink grosgain ribbon for the waist tie. JLH’s last couple of patterns have been released with different cup size options, which is a great idea. I made the size 6 D cup and the fit is spot on. Enough room to move about and not feel constricted but not too baggy. I love that Jennifer always includes quirky details in her patterns, such as the crossover bodice. It sits really nicely and enables you to get it on and off easily without the need for a zip. I did find that the skirt was a little too A-line for my taste, and I may go back in and take some width out of it at some stage. However, I think that if the fabric was drapier, like a viscose, it wouldn’t be an issue. The only change I made to the pattern was to create a really narrow hem using bias binding, as I didn’t want to lose any length from the skirt as I felt it would have been too short on me. 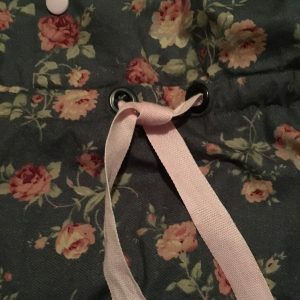 I have done a tutorial on how to use bias binding to finish a hem here. Overall, I am really pleased with how this turned out and will definitely make another version out of a drapier fabric next time. I’ve seen Jennifer’s 3/4 length sleeve version and will try that one out for a more Autumnal feel. I wasn’t so drawn to the pattern, but seeing it made with a great fit, it’s lovely. It’s perfectly simple and uniquely Vouge casual at the same time. Oh to be a better seamstress to be able to accomplish this dress. Thank You! Really lovely!